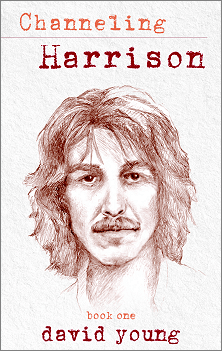 David Young: I wrote my first book, Channeling Harrison – Book One, and when I was writing finishing that book, my publisher, who had done many books about channeling and paranormal stuff, he told me that it was very likely that if George was involved in my life, John Lennon was likely to join the party at some point. I really didn’t think that was possible; I thought that was very silly. It just didn’t make any sense. I mean, I didn’t believe in channeling, this stuff was such a stretch to me anyway. That just seemed like a ridiculous thing and I wouldn’t even give it an ounce of thought, ya know? So, in October of 2013 I was in Hawaii, and I still had no idea why George had chosen me, and I went into meditation. While I was in meditation I had this incredible spiritual experience with George. He was a very enlightened soul. He dedicated his life to spirituality and sharing his spirituality with the world. He used his fame as a Beatle to further to uplift mankind. I know that may sound like a real grandiose statement, but everything he did he did for a really positive reason. So, I was in meditation, and I was having a really great experience with George. It was the coolest thing I had ever experienced in my life. I had been meditating for 27 years, and in this experience, John Lennon joined the conversation. I said, “John, are you part of this thing?” He told me, “Well, I am not making any long term commitments, but, yes.” I had no idea of John’s sense of humor. He jokes around a lot. Well, that experience lasted for about an hour, and after the experience was over, I was just trying to take all of the stuff in. Two weeks later I was in Cincinnati and this woman comes up to my table. She tells me she is a channeler and she had bought some of my meditation music. I thought to myself, “This woman is a channeler, and although I never believed in channeling my whole life…” But after that experience in Hawaii, I thought that anything was possible. I never thought that John Lennon and George Harrison would be involved in my life. So, I set up a session with her. In that session, I swear to G-d, the only thing I said was “George Harrison” and five minutes into the session she looked at me and said, “Did you know that John Lennon was involved?” I swear that I hadn’t even mentioned John’s name. So, for the following hour, she told me all of the things that John had told me in Hawaii and a lot of the stuff that George had told me in Hawaii. It was really incredible. This has been an amazing, mind-opening experience because I didn’t believe in any of this stuff, ya know? Morwen: So, you said you didn’t believe in any of this. How did they begin appearing to you? You said in meditation, but can you elaborate on this? David Young: Do you wanna know how the experience started in 2010, or do you wanna know about when John got involved? Morwen: I would love to know how the experience started. David Young: Okay, well, … it was 9 days before my 9 year anniversary. I had adopted my ex’s two daughters. They lived with me in my house, and up until that point, it was my favorite relationship in my whole life. It was coming to an end, and that was a real heartbreak for all of us. I had been traveling between 40 and 45 cities a year, performing at massage conventions, healing conventions, meditation conferences, and all kinds of spiritual events. I had been flying to 40 or so cities a year for all this time. Because the economy was tanking, and everything was falling apart, in my life and in the world, it was really messed up. I decided that I had better move back to the East Coast. The airfare had gotten so expensive that it wasn’t practical for me to continue flying. So, I was driving across the country, saying goodbye to my old life, not knowing what was going to happen. At that point I had sold a million cds, I had been very successful. I owned houses in California. I owned mansion. And here I was really worried about whether or not it was all going to fall apart. I wondered what was going to happen to my life. Because I was so distraught, while I was driving back to the East Coast (because there I could drive to all the cities I usually performed in), I was in my car and I had this pile of about 50 cds sitting next to me, all outside of their cases, very randomly on the seat. So, I said to G-d, “Pick me a good one, something that is going to help me feel better.” The cd I had picked out was one I had not listened to much. It was a Christmas present, and it just happened to be in my car. It was “Sgt. Pepper’s Lonely Hearts Club Band,” and I thought, that funny. G-d has a sense of humor, I am sure you have found that out along the way as well, right? David Young: So, I put the cd on, and when song #8 came on, it was George’s song “Within You, Without You.” It is the song that starts with the sitar, and it’s a very spiritual sound. There was something about listening to that song that just brought me peace. When the song was over, I played it again. Then I played it again. I played it over and over for 3 hours while I was driving to the East Coast. So I get to this guy’s house and he was all happy to see me, I hadn’t seen him for 25 years. He goes, “Well my best friend is a guitar player and he really wants to meet you. He has heard your cds and he thinks you are great.” So we go into this guy’s house, and sitting on his television set is the concert in Bangladesh which is the concert that George had put on in 1971. What had happened, well I never thought about this until now, but George was learning how to play the sitar from Ravi Shankar and so he became very close to Ravi. He became like a dad to him as well as a very close friend. So there was a horrible cyclone in Bangladesh and people were dying, millions dying like flies in Pakistan, and so Ravi Shankar called up George and said, “Can you get together some of your famous friends and put on a benefit concert to raise money for these starving people?” Up until that point there had never been a benefit concert before, and so George created the first benefit concert, like an all-star jam. It took place in Madison Square Garden in August 1, 1971. They did one concert in the afternoon and one in the evening, and over time over $100 million dollars was raised for those starving people. If he was Catholic, they would have made him a Saint! That book over the last 40 years has sold over 5 million copies. It’s incredible. The amazing thing about this is that this is the first time, perhaps in history, where the relationship between two people that are not physically alive anymore, where there’s enough of these synchronicities, and there’s enough miracles in the whole story where it actually proves that there is life after this life. There are a whole lot of people who have had experiences with spirits or with their grandmother who passed on or something. But, the way they set up all of these synchronicities in my life prove that there has to be life after this life, or else there is no way I would be getting this information that I am getting. Things that I knew nothing about! I decide to make this painting a year after the situation started. This is a unique situation because I couldn’t draw. I would never think of painting. I couldn’t draw, so why would I paint? But, one day I got this idea to start painting, so I painted this 3 foot by 4 foot painting for 10 hours. I mean, why would I do such a thing, right? After I had finished painting this thing, my girlfriend at the time, she buys me a book on George’s life, because even though she was a Jewish girl from Brooklyn who didn’t really believe in any of this stuff, she felt like there were three of us living our apartment. So she buys me this book, and in this book was a picture of George wearing his favorite jacket and he had it custom made for him. It was the same 4 colors and the same pattern of the Great Pyramids surrounded by burgundy, gold, and black. It was the exact same pattern that I had painted in my painting. So the good thing about that was that I had some spiritual ammunition in a way, where my friends and my family thought that I was losing it. They thought that I was losing it or was just completely out of my mind. They had something that there was no way that they could dismiss it. Everyone knew I didn’t paint. It was so out of character for me. These are the stories that are in book two. I don’t make these stories up, I just write them down so that I can share them with people. David Young: It is kinda like that, but you see, I don’t know how to channel. There are some folks that have an “on/off” switch. They can hear stuff all the time, but it was never natural for me. Although, music was very natural, and they really like working with me and making music with me. There is a famous channeler in Canada named Bob Murray, and he has written a couple of books called The Stars Still Shine. He has been channeling for 30 years. They call him father Bob Murray, and they used him to contact me so they could communicate with me. This happened about three years after this experience started. It happened about 2 weeks after that experience in Hawaii where I experience John for the first time. This is so out there. For people who are open to this stuff, they get it. When I started sharing these stories with people, it can be mind blowing for some people to hear this stuff because it’s like there’s a direct line of communication to me through Bob Murray and the stuff they create in my life. I don’t think this is ever going to end. They are like my spiritual brothers now. I talk to them pretty much every single day, through Bob Murray. The conversations that I have with George and John through Bob Murray, these things always manifest in my life. I will have somebody out of the blue say the same thing to me. Or I will have somebody write a letter to me that says the exact same thing they were talking to me about. It is pretty phenomenal. Morwen: Because that you stated earlier that you did not believe in channeling in the beginning, they have made it very clear that, yes, this is something you should believe in. This is really happening. David Young: Well, it would be as if you had a scientist that did an experiment 200 times, and if he still doesn’t believe the outcome then there is something wrong with the scientist. Morwen: (laughing) Correct. That is a good point. So, if they are still hanging around and speaking with you, did they speak to you at all about reincarnation? Do they plan to take another body at some point? David Young: Well, I have to tell you that… Remember when I told you that George had this enlightenment? He is not just the guitar player from the Beatles anymore. Since I wrote my book, I have had – well I stopped counting at 20 –but I have met so many people who have been having spiritual experiences with George and John. Like, I did this book signing in Denver for the New Age book show. There was a long line for me to sign books, and so many people had stories where they had experiences with either George or John, that I have come to the conclusion that they don’t have to reincarnate anymore. They are working with the universe the same way that Jesus, or the different saint or prophets work with the universe. They have reached a higher level of consciousness, and they are helping people all over the place. I have to tell you, starting about a year ago, I started meeting people that were telling me their experiences and the truth of the matter is that I didn’t believe a word that they were saying. Even though I was having my own experiences, I know it’s funny. There was this one woman that I met who was working at this art gallery. I had just moved back to New York and I was trying to figure out what I was going to do. So I decided to show her one of my paintings I had done, because I had started painting after that whole experience. I showed it to her, and she said “That is bizarre. I just made a painting just like this.” So we went out and had coffee. That was two years ago. During that conversation, I said to her, “Now I don’t want you to be uncomfortable if you don’t want to talk about this, but for the last couple of year I have been having these experiences with George Harrison.” She almost fell off the table and hit the floor. This woman had been mugged and had some hard times, and so she had decided to stay in her apartment for about a week, and she decided that she was going to make a video, even though she didn’t know how to make a music video. The song, the random song of all the songs in the universe, that she decided to make a video of was the same song that I had listened to for three hours a day for three weeks when my experience with George first started. Honestly, because this was two years ago, and I was still skeptical, I didn’t believe her. She had this great story that she was telling me, but I let it go in one ear and out the other. Unless I saw it for myself, I just didn’t believe it. Well, we became friends, we stayed friends, and we fell out of touch for while. We got back in touch and she retold me this whole story because I had forgotten. For days she had worked on the video, hypnotized. Then two days after she made the video, she got her job at the gallery, then two days after that I met her. All of this stuff started happening right after she had that experience with George. Now we are good friends. She is friends with my girlfriend, and it is just amazing. So, they literally have connected me to other people they are connecting with. Morwen: That is really very cool. .. So they are appearing to these people, George and John. Is there an essence to the message they are giving to these people? David Young: Well, I was thinking that I could make a really funny joke right about now. Something really silly… Really though, this is a multi-dimensional thing. I can’t answer that in just one answer because there are so many reasons why they are doing this. One of the reasons why they are doing this is because if you go back in history… for thousands of years, people have believed that our ancestors have guided us and helped us. They are always with us. That was the normal belief system in the world. But, once certain religions started becoming more and more powerful, they didn’t want people to believe that we really can communicate with our ancestors. For whatever reason, it didn’t go along with their program. For a long time, it became taboo to talk about the fact that we can have spiritual experiences with our loved ones who are not alive physically anymore. John and George, because they were so spiritual when they were alive, … When people are very spiritual when they are alive, they are going to be very spiritual when they are not alive because they already started working on the spiritual part. So, G-d is using them to show mankind that there really is life after this life. You don’t have to be afraid of it. If you have a grandmother who loves you every minute of her whole life until she died, there is no reason in the world that you cannot communicate with her. She still loves you. Just cause she is not aligned physically, her soul still loved you while she was alive. There is no reason why her soul is going to stop loving you because her physical body stopped working. She is still alive in her spirit form. So, because the Beatles were so incredibly powerful in this world, among many other things, G-d is using them to show mankind that this stuff is real and possible. And whatever the Beatles did had a massive effect on mankind. There is no doubt about it. When they changed hairstyles, the world changed hairstyles. When they changed their music…..
G-d is using the Beatles to work through me and to bring this whole thing out. The whole unnecessary belief system of being of afraid of life after this life, and being afraid of communicating with your loved ones who are not alive anymore physically, that thing is over. So, she tells me about this afterwards, and a couple of days later we go to visit my mom. I had left some of my paintings at my mom’s apartment in NJ. I had been painting John Lennon’s face a year before I had known that John was a part of this. I decided to pull out this painting, even though I had already shown it to her on my cell phone. She get the chills and says, “Those are the eyes I had seen in my inner vision, in my meditation.” Those almond shaped eyes. Later that day I called up Bob Murray so he can explain stuff to me. John said, via Bob, that this was their way of welcoming Dawn into our family. David Young: The funny thing about it is that when this happened we were all like “Wow.” But, the following week something more incredible happened. So, it’s like this constant, amazing spiritual adventure they have turned my life into. I was a spiritual guy before all of this happened, I meditated every day for 27 years when it started. But when it really started kicking in was after 30 years of meditation. So, they had an appreciation for the fact that I was making spiritual music; I was a spiritual guy, and because of that I was perfect for this job. Morwen: It seems to me from what I am hearing that they are helping to facilitate other people’s spiritual growth. But something that I am finding to be a similarity between you and your friend from the gallery is that they also came to you when you were at a low point and really very vulnerable. Is that true of other people’s experiences? David Young: Well, I was going to make a joke and say, “Yeah, if you wanna hang with the Beatles, you gotta go through hell.” But, um,…. Well, you know what I think, in life – and I don’t know of anybody who has any spiritual unfoldment that is going to argue with this – but we are more open to receiving help from wherever when we really need help. I mean, when it’s a beautiful day, it’s sunny out, and you are with your lover at the beach and everything is going great, you aren’t reaching out for G-d’s help in the same way. It is not necessary. When life is hard, we are open to #1, ask for help. And when we ask for help, maybe it is more possible for us to receive help. Even from places we would never dream this help is coming from. Morwen: That is a good point. I hadn’t thought of it in that way before, but I believe you are right. That is absolutely true. David Young: There are a lot of people they have used to connect with me for various reasons who, um, they weren’t Beatles fans. It wasn’t like this was something that was brought about because of their music, which is kind of a unique thing. Some of the people they have used to connect with me weren’t old enough to be Beatles fans. I wasn’t even old enough to be a Beatles fan. That’s why I was so surprised that this stuff started happening. But, some of these people are in their 30s, or 20s. That is very weird…. Well, I don’t even use that word anymore…. My friend in California, he is 50, and he is starting to date this woman who is 20. It is their first date, and he is trying to connect with her and everything, so he says, “If you could meet any person in the whole world, tell me who that would be and why.” So, she says “George Harrison.” My friend almost had a heart attack! He didn’t think she was going to say that. This girl wasn’t even born when the Beatles stuff was happening. So, he tells her about my book and channeling George Harrison and she’s like, “No way!” He swears to her, but she doesn’t believe him. So they make a bet, then they call me. She says “How are you doing? I am told that you channel someone.” When I told her who, she had to pay for dinner, as was their bet. Why would a 20 yr old woman, who knows nothing about the Beatles, say that is the one person she would want to meet. Morwen: Well, I’ll tell you, George Harrison’s music, the way he wrote, has touched people through so many generations. I am actually a fan, and the first song I taught myself to play on accordion was “While My Accordion Gently Weeps.” But, yeah, his music transcended all time, really, I feel. I think it is wonderful that all of these people keep coming into your life and reaffirming that for both of you. David Young: You mean for me and my girlfriend? Morwen: Well, you and whomever is also sharing that experience. For you and your girlfriend that happened. For you and that other lady your friend was dating, and I mean, it’s pretty fabulous. David Young: It really is fabulous to think that. I am going to tell you, I didn’t know anything about George’s music. I am also a guitar player and singer, besides making this spiritual music. I would go to jam session, I am a professional guitar player, and at these jam sessions people would play a Beatles song and I would be embarrassed because I wouldn’t know how to play it. It was like, the Beatles are the most popular band of all time, and I don’t know how to play a single Beatles song? Morwen: I had a question for you, and I lost it. David: Well, I have an idea. Why don’t you go silent and ask George what it is. Okay. Actually, I have a different question. Tell me about your favorite experience with George. David: Well, in my book there is a chapter that is called “Goodness.” That was the chapter that happened in Hawaii where I experienced his energy in a spiritual way. It was the way people would describe a spiritual experience with Jesus, or Buddha, or something. It was that kind of experience. Which, as long as I had been meditating, I had never had an experience that profound, so that was my favorite experience. My world got incredibly surreal. The other thing that was really amazing was how they used Bob Murray to contact me. And, whenever I tell this story at my events, people love this story. George had gotten me this publishing deal, he did that for me. It sounds amazing, but you can read about it in the book. It explains all of it. So, I went down to visit my publisher who lived out in the boondocks, in the middle of nowhere, on a dirt road in nowhere in Virginia. If you look for “Nowhere” on the map, that is where it was. So, I am at my publisher’s place and, well actually, I will tell you about another thing that happened right before it, as this is all part of the story. He said, “We have got to write something at the end of the book. That is why people are buying the book, cause they wanna know what this is all about.” So he starts typing into the computer, on the manuscript. He starts typing, “What George wants is….” And before he can finish his sentence, George shuts off the power in his house and shuts his computer down. Now it was a beautiful day, there was not a cloud in the sky, it was gorgeous out. It was August! It was so obvious to me what had happened, and it was so hilarious at the same time because now I had gotten to see someone else react to this stuff. Where for three years those kind of things were happening around me, it was great to see someone else reacting to it, instead of me. I just thought it was hilarious. And then that night we went to this bar restaurant where he had some friends that were playing guitar there. And because he know I was a professional guitar player, he kinda wanted me to go there and show off all of his friends, because he knew that they were all beginner to intermediate players, and I was professional. I have done this my whole life, ya know. We go into this restaurant, and I get out my guitars. Now I had left my guitars at my mom’s apartment in New Jersey. For some reason every time I had finished tuning up my guitars, when the first song was over, my guitar would go out of tune again. I mean, my guitar never did that, and it just didn’t make any sense. So for an hour, every couple of minutes, I am tuning up my guitar. This goes on the whole time I am there. At the same time I am at the restaurant, a mutual friend of my publisher and I, her name was Kathy, she had tried to do some channeling for me to try and figure out George wanted in all of this thing. She was a friend of my publisher, and I had met her a couple of times at some spiritual events as well. So, she came over, she did a channeling session cause she was just learning how to do it, so what she got in the session was that George said I am in the same soul group as him, and that I was doing a good job of keeping track of all of these stories for the book and to keep up the good work, you’re a good musician. So, while we were at the restaurant, she is at a party three doors down from where my publisher lives, in the middle of nowhere on a dirt road that has 10 houses. You can see mountains and grass everywhere around. It really is in the middle of nowhere. And she said her friend Lori was asking what she had been up to and she said she did the channeling session for my publisher, and that she met this fellow who channels Harrison. Her friend thought it was weird. She says, “I just got a phone call from this guy from Canada named Bob Murray, and this guy has written about channeling a lot of famous people and I have to edit some stuff for this guy (Lori was an editor) and he channels John Lennon and George Harrison. I think this is really weird that you are telling me this.” Well, that was on a Saturday night. Monday morning she calls up Bob Murray and says, “My friend was at a party at this house and there is a guy named David Young that has written this book called “Channeling Harrison,” and I just think this is weird that you just contacted me and you have been channeling George Harrison and John Lennon also. Just for the record, I don’t make these up, I just share them. It’s fun. After the initial shock of the whole thing wore off, ya know, it’s kind of cool. They really wanted me to have witnesses. They know that there is a certain resistance that people have. And so while I was staying at my mom’s place, George started showing himself to my mom so I could have a witness. And now whenever I do an event and my mom is in the area, she comes up on stage. My girlfriend also comes with me a lot and she will tell the story of the eyes and everything. Morwen: So your mom is involved in this as well? David : My mom is a 78 yr old Jewish woman from Brooklyn. And it is just amazing that the guys have shown themselves to her, and I can actually bring my mom onstage at those events. My mom has stories that she shares. Morwen: Tell me, do you travel around a lot? You mention doing events, do you go to various events speaking about these experiences? Morwen: Well, I really enjoyed speaking with you. Thank you so much for your time. I will encourage the readers to go to the facebook page and hopefully we can all meet you and George at one of your future events.